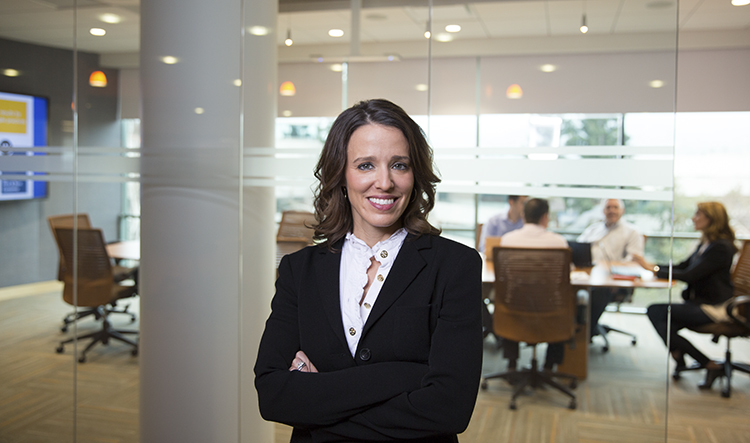 As Workday’s HR leader, a big part of Goldsmith’s job is to help ensure that Workday retains its strong workplace culture—a culture that’s gained it both regional and national recognition. Workday was named to Fortune magazine’s list of “100 Best Companies to Work For” this year, and ranked #1 among largest companies on the “Best Places to Work in the Bay Area” list by the San Francisco Business Times and Silicon Valley/San Jose Business Journal. You’ve been at Workday for a little more than a year now. What drew you to the company? I was a big fan of Workday already. I had the opportunity to participate in an application demo on the Workday campus in a prior job role, and the technology just blew me away. The most remarkable thing, however, was the people all just seemed so happy and nice. I will never forget as we were leaving that day, my whole team was looking around at each other asking, “Do you really think they’re that happy?” When I got a phone call about the new CHRO position open at Workday I thought, that’s just one of those calls you need to take. How do you reinforce that positive environment as the company continues to grow globally? We’re proud of our culture here at Workday, which has earned us high rankings in many employee satisfaction surveys through the years. We’re now getting recognition outside the U.S.; we were recently named #4 on a great places to work list in Ireland. It all starts with who we’re hiring. Getting the right people, who share our values and can expand and develop them as we grow, is what we look for. We like “we” people—those that like to collaborate and innovate together, not folks intent on taking all the credit for themselves. Our Co-Founders Dave Duffield and Aneel Bhusri actually interviewed the first 500 employees, meaning they interviewed about three times that many people to find those first 500 employees. I find that just staggering. That shows how committed they were to getting the right people to cultivate the culture they envisioned. Great culture has to start at the top. You’ve attended several HR events this year, and participated in some panels. Was culture discussed at these events? Yes. At a Deloitte’s HR Academy conference in Dallas last month, Josh Bersin predicted culture would be the leading trend over the next year. Culture is the new black! It’s like everyone woke up in this really competitive market and realized they can’t win without a strong culture. At Workday, we are very fortunate to be faced with the opportunity of sustaining a great culture instead of the challenge of figuring out how to turn it around and make a major transformation. You can’t wave a magic wand and make that happen in a large enterprise with a weak culture. There is still more we can and will do at Workday—more with our careers website to attract the best talent, and more manager-enablement training to ensure managers are receiving the skills and confidence required to support our culture on their growing teams. About half of Workday’s global workforce is based in the Bay Area, which has a very competitive talent market. How does Workday compete for Bay Area talent? It’s very competitive everywhere, but hyper-competitive in the Bay Area. We choose to compete by leveraging our culture, brand, and reputation. We’re grateful to do so well in workplace surveys and lists, as the recognition offers a great competitive advantage. When I ask people what their favorite part is about working here, no one responds with, “Oh, we have a great snack program.” They attribute their happiness to the people—their colleagues who always support them. I strongly believe there is a business case for having a positive culture, and you need to have in place a leadership team that drives home those core values to make it work. In fact, Dave and Aneel say the word culture even more than I do— just listen to our earnings calls!